WHY WASTE YOUR TIME ON A SHORT SALE WHEN YOU CAN BUY BRAND NEW AT A GREAT PRICE!!! Magnificent King Fisher 3 floor plan built by Cardel Homes on a cul-de-sac street with partial waterview in highly sought after community of Country Walk has lots to offer. First floor boasts Large Master suite with huge walk-in closet at Master bath, his/hers sinks, garden tub with separate shower & vaulted ceiling. Spacious kitchen with center island, 42" cabinets, granite countertops, walk-in pantry, Kitchen opens up to large great room with sliders to lanai. Great for entertaining. Two additional bedrooms plus bath, Den and Living/Dining Great room combo all on the first floor. Second floor features bedroom with full bath & Large Bonus room. Come enjoy the good life whether you are relaxing on your lanai enjoying the views or enjoy the community amenities which include community pool, fitness center, playground, sports courts and much more. Minutes from great shopping (Wire Grass Commons), restaurants, and minutes from I-75. Call today to find out more about home warranty and paid closing cost! 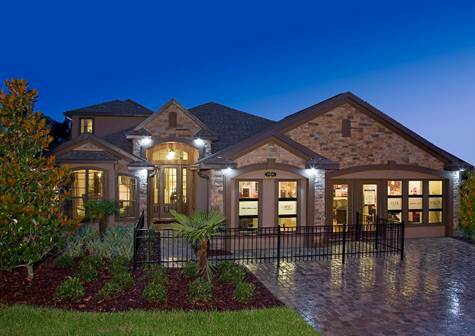 PLEASE NOTE: Pictures are of other models homes and are shown to depict the type of features that the builder offers.